five years (for a current total of perlaps 40 million players) is partly responsible for the atmosphere of technological innovation, both dubious and legitimate. But a good deal of the cause lies in the nature of the game itself. Good tennis is an exacting, painstaking and time-consuming pursuit, for which better-thanaverage physical condition and athletic ability are prerequisites. Yet few average players, or "intermediates" is tennis players style themselves, spend much time just practicing the game. Public courts are jammed, playing time limited, and fees for private and club courts are going through the roof. Having paid $20 or more for an hour of court time indoors in most major cities, few players are going to spend it smoothing out the rough spots in their strokes. Teaching professionals and coaches rail against this syndrome, but to little avail. A more powerful influence i.. the often evident American tenlency to look for any available technological shortcut-better equipment, better shoes, a better racket. \t least partly in response to this ipproach to the game, there are now :ome three dozen different tennis .ackets on the market, at retail prices of from $65 to $200, which :c'en't made of wood or metal, but ire of composite construction. terials are bonded or molded together. Elements of wood, steel, aluminum, glass fibers, epoxies and plastics are all being used in these racket frames, but the glamour elements of composite matrix construction are graphite and boron fibers. These space-age fibers are manufactured molecule by molecule in superhot furnaces and then woven into iapcs or mats which can be built up and bonded with epoxy resins to form a structural unit-a racket frune-with an amazing strengthto-weight ratio. Tennis rackets made this way are undoubtedly stronger than those made of wood, fiberglass or metal. Yet even more is being claimed for composite rackets, which are often promoted with statements that fall just short of guaranteeing a remedy fur every (law in the average hacker's technique. I've pored over a lot of racket brochures and ads recently, and while high-school physics is only u dim memory to me, it seemed that a number of these amazing pieces of equipment had escaped from Newtonian reality. measure of force moving through distance. I phoned the manufacturer and was referred to another company that supplies the graphite racket frames. Their project engineer, however, could offer no guess as to how the statement originated. This was a surprise, since I had anticipated the claim to be a distortion of a 70-percent coefficient of restitution (the. proportion of the ball's original velocity at which it rebounds from a given position on the racket's face), which would be a good one as rackets go, but would by no stretch constitute "work." "There's a very low level of sophistication in research and development among tennis racket manufacturers," another engineer told me. A former corporate R&D director in a high technology industry, he had been appalled when during a visit to one of the top-brand racket companies he had asked to see their lab facilities. "The most complicated piece of equipment they showed me," he recalls, "was nothing more than a machine that automatically throws.. tennis balls at a racket to see how long it holds up." u formal Israeli Olympic discus thrower, heads a Massachusetts firm called Computerized Biomechanical Analysis. By computerizing the images from high-speed motion-picture film of various athletic activities, Ariel can analyze performance and utilize computer simulation to predict the results from adjustments or improvements in both technique and equipment. He helped Spalding design a new tennis ball, and those studies have prompted him to look more closely at tennis rackets. 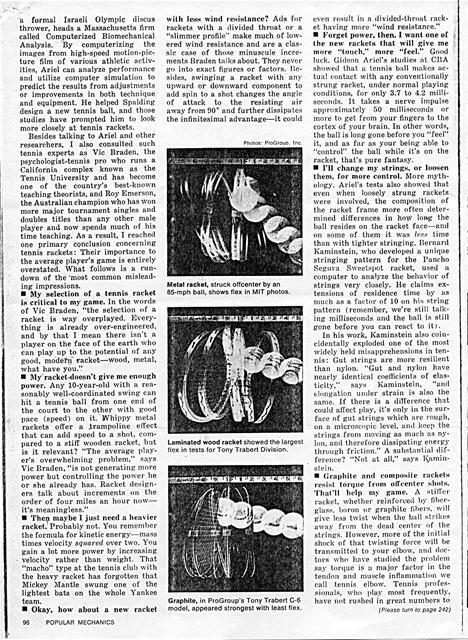 Besides talking to Ariel and other researchers, I also consulted such tennis experts as Vie Braden, the psychologist-tennis pro who runs a California complex known as the Tennis University and has become one of the country's best-known teaching theorists, and Roy Emerson, the Australian champion who has won more major tournament singles and doubles titles than any other male player and now spends much of his time teaching. As a result, I reached one primary conclusion concerning tennis rackets: Their importance to the average player's game is entirely overstated. What follows is a rundown of the 'most common misleading impressions. ï¿½ My selection of a tennis racket is critical to my game. In the words of Vic Braden, "the selection of a racket is way overplayed. Everything is already over-engineered, and by that I mean there isn't a player on the face of the earth who can play up to the potential of any good, modern racket-wood, metal, what have you." ï¿½ My racket-doesn't give me enough power. Any 10-year-old with a reasonably well-coordinated swing cart hit a tennis ball from one end of the court to the other with good pace (speed) on it. Whippy metal rackets offer a Zrampoline effect that can add speed to a shot, compared to a stiff wooden racket, but is it relevant? "The average player's overwhelming problem," says Vic Braden, "is not generating more power but controlling the power he or she already has. Racket designers talk about increments on the order of four miles an hour nowit's meaningless." ï¿½ Their maybe I just need a heavier racket. Probably not. You remember the formula for kinetic energy-mass times velocity squared over two. You gain a lot more power by increasing velocity rather than weight. That "macho" type at the tennis club with the heavy racket has forgotten that Mickey Mantle swung one of the lightest bats on the whole Yankee team. Metal racket, struck offcenter by an 85-mph ball, shows flex in MIT photos. Laminated wood racket showed the largest flex in tests for Tony Trabert Division. Graphite, in ProGroup's Tony Trabert C-6 model, appeared strongest with least flex. even result in a divided-throat racket having more "wind resistance." ï¿½ Forget power, then. I want one of the new rackets that will give me more "I ouch," more "feel." Good luck. Gideon Aricl's studies at CI.A showed that a tennis ball makes actual contact with any conventionally strung racket, under normal playing conditions, for only 3.7 to 4.2 milliseconds. It takes a nerve impulse approximately 50 milliseconds or more to get from your fingers to the cortex of your brain. In other words, the ball is long gone before you "feel" it, and as far as your being able to "control" the ball while it's on the racket, that's pure fantasy. ï¿½ I'll change my strings, or loosen them, for more control. More mythology. Ariel's tests also showed that even when loosely strung rackets were involved, the composition of the racket frame more often determined differences in how long the ball resides on the racket face--said on sonic of them it was less tune than with tighter stringing. Bernard Kaminstein, who developed a unique stringing pattern for the Pancho Segura Sweetspot racket, used a computer to analyze the behavior of strings very closely. He claims extensions of residence time by as much as a factor of 10 on his string pattern (remember, we're still talking milliseconds and the ball is still gone before you can react to it). 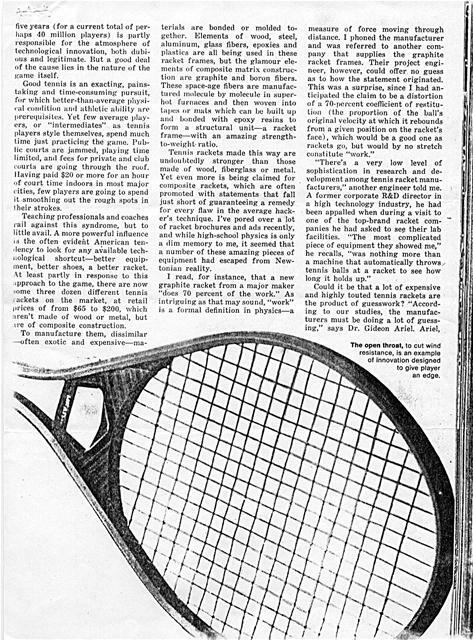 In his work, Kaminstein also coincidentally exploded one of the most widely held misapprehensions ill tennis: Gut strings are more resilient than nylon. "Gut and nylon have nearly identical coefficients of elasticity," says Kaminstein, ".u rd elongation under strain is also the same. If there is a difference that could affect play, it's only in the surface of gut strings which are rough, on a microscopic level. and keep the strings front moving as much as nylon, and therefore dissipating energy through friction." A substantial difference? ",Not at all," says lS:rnrinstcin. Foyt to Indy this year? Well, no one's entirely sure, but everyone knows that A.J. 's got the stuff to be either the first man to go over 200 mph at Indy or the first man to win a fourth Indy 500. Or both. Lest it be thought that the famous four-cylinder Offenhauser engine is (lead, consider the fact that Roger McCluskey eased his Lightning-Offy up to 198.7 mph in tire tests at Indy last summer. That car, by the way, has been sold to Rolla Voldstedt for Janet Guthrie to drive. This could be the year that Tony Hillman has to abandon that famous and dramatic line, "Gentlenten, start your engines!" McCluskey will be at the helm of a brand-new Lightning, as will twotime winner Bobby Unser. The new Lightning cars were designed by Roman Slobodynsky,j who did the current crop of Eagles for Dan Gurney (but not the new one), and there could be as many as seven of them at the track this year. Not to be left out are George Bignotti's creations. They're called Wildcats and will be driven by Wally Dallenbach and 1976 USAC National Champion Gordon Johncock. Gordo, Indy winner in 1973 in a Bignottiprepared Eagle, had the Sinm:astsponsored car in the middle of the front row..last year so it's a proven fast car. "They'rt' going to go 200 mph at Indy, but it won't be during May," says Bignotti. "I think it'll he during the off-season when the weather's cool. Unless it's a very cool day, I don'ti think we'll see 200 mph." Most everybody agrees that the removal of the pop-off valve daring the race is going to mean more blown engines and less car-to-car dicing because a driver can dial up a little more boost to whiz away from 8"1110body who's closing. But at the same time, he risks overstressing his engine. And 200 mph? Well, it could happen. But it's going to take an optimum day-cool, no wind-and a perfect lap to do it. ï¿½ But pros always hit the ball with the center of their racket strings. Tennis racket manufacturers seem to think so, but the pros themselves often disagree. "Hardly anybody, amateur or top tournament professional, can consistently hit a hall with the center of the strings," says Vic Braden. "It's so unusual that I remember years ago when Pancho Gonzalez and I walked into the Chapultepec Tennis Club one day both of us stopped in our tracks because Rafael Osuna, the great Mexican player, was practicing and he was catching the ball dead center time after time. That's very rare." ï¿½ Then I should play with the racket my favorite pro uses. There's no telling, but it. 's certainly not critical. Your favorite pro could probably play and win with any of a dozen rackets. Some do, almost; Swedish star Bjorn Borg uses a Bancroft racket when he plays in the U.S., a Donnay model in his European appearances and a Slazenger in Australian tournaments, because he gets paid hard cash for it. In addition, professionals often string their rackets very tightly; the same racket more loosely strung for an average player's game is a different animal. ï¿½ Graphite rackets "damp" vibrations. Their manufacturers make that claim, but it's relative and perhaps, depending on the particular racket, even false. One of the problems is that manufacturers benchtest rackets that are firmly gripped by a vise-like support, and the reaction to shock is entirely different than it might be in actual play. "In play," notes Gideon Ariel, "the racket and the player's arm rotate as a unit from the shoulder, and among other things this establishes the racket's center of percussion at somewhere down on the shaft, near the throat, not in the center of the strings, on the so-called 'sweet spot.' So, because the ball strikes any racket at a point other than the center of percussion, vibration pal torn resonances result, and the behavior of the racket is often unpredictable. In our computer simulations showing vibrations transmitted to the racket grip, some of the graphite rackets were Norse than other kinds." Right now, there is so much disagreement on the role of vibration in tennis elbow, and investigation is in such a preliminary stage, that the player- pretty much has to experiment for himself if he is prone to the condition. The medical profession tea is Io recommend a flexible (metal) raï¿½ï¿½kï¿½t to absorb initial shock; researchers like Ariel say what happens to the racket after the initial shock, after the ball has left it, may be more of a factor in causing tennis elbow than the impact itself. When it comes to vibrations, "similar" materialsmetals-are least effective in damping and actually amplify vibration, while "dissimilar" materials tend to clamp them. Few are more effective than that natural composite of cellulose and resin we call wood.  But wood rackets get worn out, mushy, after a while. Maybe so, but it takes a lot of hitting tennis balls before that will happen. Roy Emerson tells participants in his tennis clinics a favorite story about the great Arrssie player of 30 years :ago. John Ihï¿½onnvich. 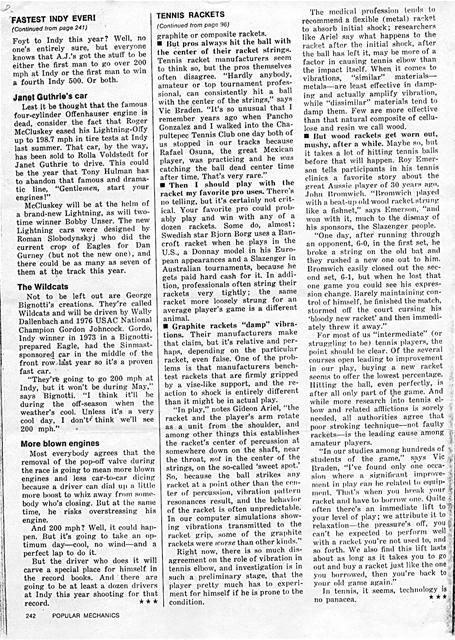 "Bromwich played with a beat-up old wood racket st.run g like a fishnet," says E'nierson, "and won with it, much to the dismay of his sponsors, the Slazenger people. "One day, after running through an opponent, ti-0, in the first set, lie broke a string oft the old bat and they rushed a new one out to him. Bromwich easily closed out the second set, 6-1, but when he lost that one game you could see his expression change. Rarely maintaining control of himself, he finished the match, stormed off the court cursing his 'bloody new racket' and then immediately threw it away." For most of us "intermediate" (or struggling to be) tennis players, the point should be clear. Of the several courses open leading to improvement in orrr play, buying a new racket seems to offer the lowest percentage. Hitting the ball, even perfectly, is after all only part of the game. And while move research into tennis elbow and related aillictions is sorely needed, all authorities agree that poor stroking technique-not faulty rackets-is the leading cause among amateur players. can't be expected to perform well with a racket you're not used to, :runt so forth. 11 'e also find this lift lasts about as long as it takes you to go out and buy a racket just like the one you borrowed, their you're back to your old )tame again." Generated on 4/18/2019 7:19:59 AM (PST) ADI/HQ/GBA/2019/ARIELCLOUD/v3.0.2018.0126.